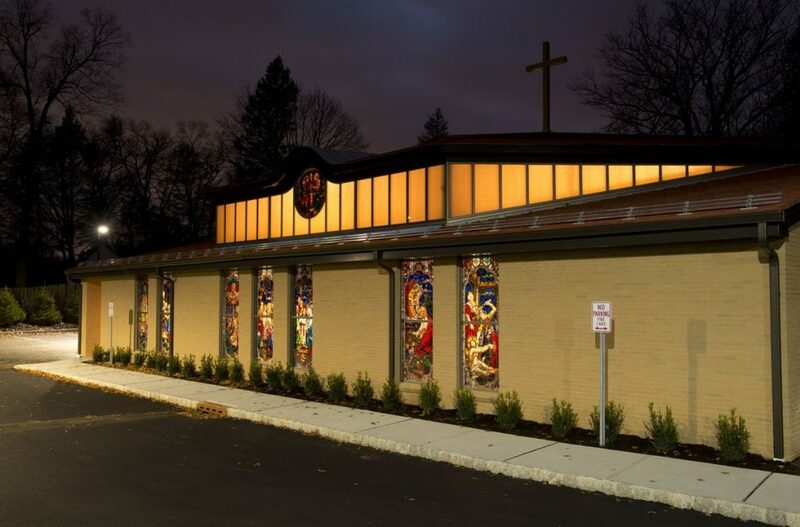 We have been working with St. Joseph Church in Demarest since June of 2014. We recently completed the first phase of our work there: the construction of a new worship space, attached to the existing facility. This portion of the project was completed and dedicated just after Thanksgiving 2016. 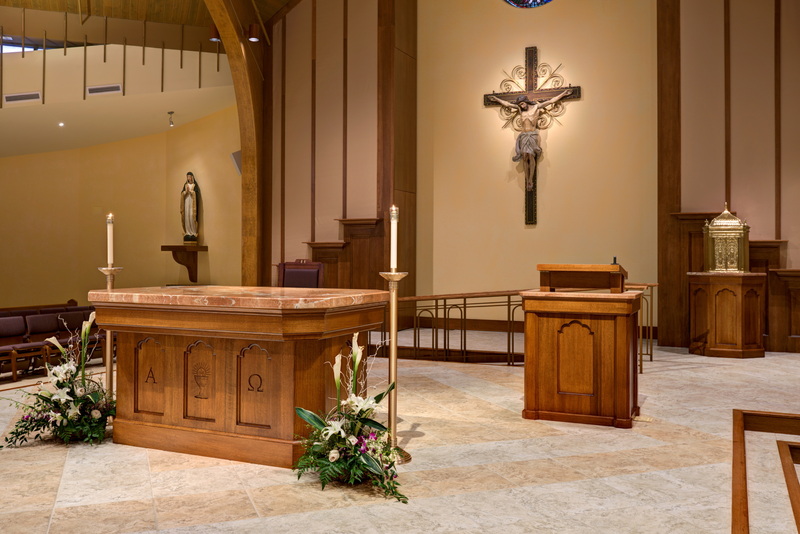 The overall goal of the project was to create a new worship space that adheres to the principals of the Second Vatican Council and meets the current and future needs of the parish. Provide visibility for the church from Piermont Road. Provide convenient access to the worship space from all parking areas. If possible, incorporate patrimony from the Archdiocese of Newark for liturgical furnishings, stained glass or other artwork. The architectural design shall pay homage to the traditions of the local church, the Carmelite tradition and the Korean Catholic tradition. The design aesthetic of the new worship space shall compliment the design aesthetic of the current worship space. Providing visibility from Piermont Road was relatively simple to accomplish by siting the building within the view of the main entrance driveway. While the new worship space was limited to a 30-foot height by the local zoning ordinance, additional height was achieved by topping the roof with a 12-foot high gold cross. The new main entrance through what was formerly the back of the original building required some additional architectural treatment to make it a focal point once in the parking lot. A new portico adds a sense of entry, protects the entry doors from the weather, and provides a convenient drop-off area. This new entrance is centrally located to all the parking areas. The Worship Space is designed to comfortably seat a total of 497 people—373 in pews, 128 in chairs and 6 wheelchair spaces. There is also space for an additional 65 chairs around the perimeter of the space for a total seating capacity of 562. The altar platform is located along a central axis. Seating wraps around three sides of the platform. In addition to the glass walls of the octagon, fenestration consists of seven stained glass windows each on the east and west sides (depicting the first fourteen of the fifteen original mysteries of the Rosary) and small rose windows high on the east, west and north sides of the building featuring the Last Supper (behind the altar) and the marriage and anointing of St. Joseph. All of those windows are from Sacred Heart Church in Jersey City, NJ. The glass octagon walls bring daylight into the building. 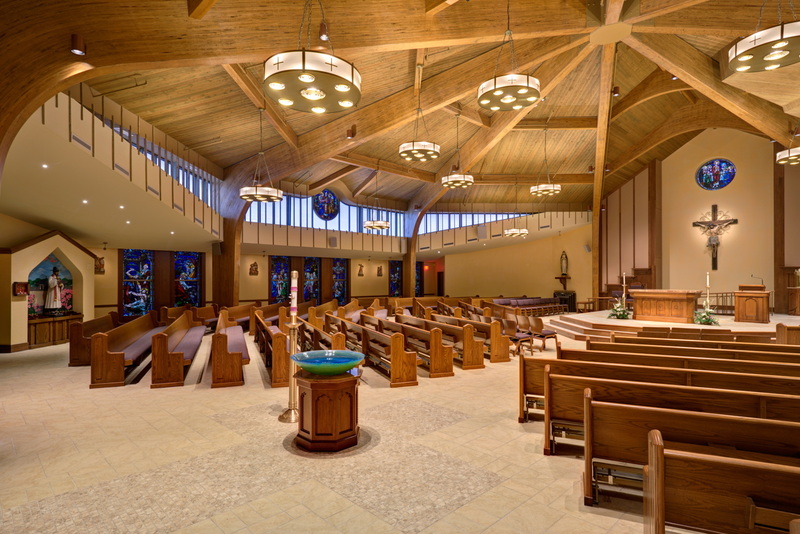 A special glass was used for the clerestory to reduce glare for worshipers. Although we originally intended to use pews from Sacred Heart for seating and had planned the worship space seating to fit the pews, the committee later decided that they were not comfortable enough and chose new, upholstered pews in the same configuration. We also incorporated the crucifix and the tabernacle from Sacred Heart Church in the final design. The parishioners selected statues of St. Francis of Assisi and Fr. Andrew Kim to pay homage to the traditions of the local church, the Carmelite tradition and the Korean Catholic tradition. All other liturgical furnishings, including the font, were designed and fabricated by Artsphere Consulting, LLC. The font bowl is made of 1/2″ thick glass and finished with a Celadon glaze. Although Celadon originated in China, production later spread to Korea, where the traditional color is the pale green-blue you see in the bowl. Please see the previous post for a video of the Dedication Mass or go to this post to read more about the history of the parish and the project. If you are in Northern New Jersey, feel free to stop by and visit the new worship space. It is almost always open for private prayer.